Directed by Richard Speight, Jr.
Outline With Jack in the wind, Sam and Dean look into the recent ritualistic killing of a witch and come across a familiar face. Lucifer, having managed to escape from the Apocalypse World, finds himself seeking Castiel's aid in stopping Michael. After being reunited with Michael in Apocalypse World, Lucifer is being held captive by the archangel in a dilapidated church. Michael proceeds to use Lucifer’s memories to take a look at the world he came from, causing Lucifer to describe the path God took and how he became bored of what he created. Michael prefers Lucifer’s world to his own and claims he is going to take up residence there and “lend a hand.” Michael taunts Lucifer, claiming he has seen his fears of being locked up, and tortures him with the cage he’s being kept in by stabbing him in the chest, leaving Lucifer screaming alone in the cage. In the Bunker, Sam is looking for Jack, to no avail. He tells Dean that there is an APB out among hunters for Jack, and Dean assures him that he will be found, arguing that there will be a sign. Castiel enters and suggests that perhaps the lack of evidence of Jack is the evidence itself; Jack has possibly been taken by Asmodeus or the angels and they have hidden him. Castiel informs the Winchesters that he is going to meet with an angel confidant who will tell him if the angels have Jack or not. With Cas out looking for Jack, Sam and Dean don’t want to sit idle. 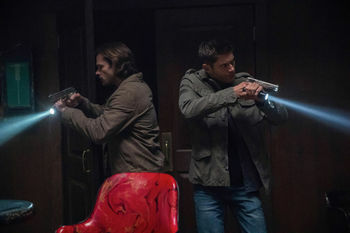 Dean proposes a case: Three apparent witches found dead; however, they appear more ritualistic than hunter killings. Meanwhile, Asmodeus sits alone in his throne room, trying to sense Jack, but he is interrupted by a demon. The demon approaches to tell him news of "The Jack", namely that there is no news. The demon tell Asmodeus that the Winchesters don’t have Jack either and it’s now a race to find him first. In Apocalypse World, Michael tells Lucifer how weak and pathetic he is in his world compared to Earth, mocking him for attempting to be God. Lucifer replies that he never tried to play God on Earth and that interdimensional travel is the reason he is weak. Michael continues his taunts by telling Lucifer he’ll be "trading up" when he goes to Earth, whereas Lucifer will remain behind, alone in the barren wasteland. However, as Lucifer points out, Michael needs the rift to do so but it’s no longer open. Michael claims he has a plan and that all of his best brains are working on it; with this he opens the door revealing his prophet, Kevin Tran. Kevin explains that he has studied the angel tablets and found a way that may recreate the rift, only needing a final ingredient -- the grace of an archangel. Michael refuses to offer up his grace. He walks over to Lucifer and with his archangel blade makes a small incision in Lucifer's throat and extracts most of Lucifer’s grace for the spell, leaving him with a little in case he will need more of it at a later time. While Sam and Dean are on the hunt for the witch killer, they find a security feed that shows a man who appears to be Arthur Ketch. Sam argues that isn’t possible as they both saw his dead body. A witch named Daniela approaches the Winchesters and appeals to them for help. She knows witches are being killed and thinks she’ll be next. Meanwhile, Lucifer tries to dissuade Kevin from opening the rift, to no avail. The ritual is a success, but as the portal opens, it causes a shockwave, allowing Lucifer to fight free from the guards and runs into the rift, which closes behind him. Back in his universe, Lucifer asks a passing woman where he is, only to be ignored as a homeless person. Angry at the disrespect, he confronts the woman, telling her he is Lucifer, but when he attempts to kill her with a snap of his fingers, he is shocked that nothing happens. The woman laughs him off as she continues on her way, while Lucifer attempts to kill random strangers walking past him to no effect. At Needham Asylum, Asmodeus is torturing a motel clerk for information on Jack and the Winchesters, but the clerk only tells them that some FBI agents stayed at the motel. After Asmodeus orders the clerk's death, he suddenly senses Lucifer has returned to Earth. Daniela takes the Winchesters to a safe house and tells them she was tortured by the witch killer but escaped, showing them the cuts on her chest. Daniela says the attacker asked for Rowena. Sam and Dean show her the picture from the security feed and ask if that is her attacker, and she confirms that it is. Dean suggests they use her as bait to lure him in. Ketch takes the bait and is tranquilized by Dean. Back at the Bunker, the Winchesters begin to torture Ketch, who claims that he has been mistaken for his brother and he is actually Alexander Ketch. He tells Sam and Dean that he ran from the British Men of Letters and has lived in hiding as a mercenary/hunter. Dean believes none of this. At the playground, Castiel meets with his informant, Dumah, who tells him that they would put Jack to work creating new angels, revealing that they are going extinct as no angels have been made since God first created them. Castiel is trapped by two more angels and realizes Dumah has tricked him. A fight ensues and Castiel is captured. At that moment Lucifer appears; he threatens the angels and they flee, not knowing that Lucifer is in a weakened state. Taking a seat on a park bench together Castiel confronts Lucifer, who instead of fighting, warns him about Michael’s plans and claims that he, Castiel, and Jack need to stop it. Castiel wants to consult the Winchesters, but Lucifer thinks they’ll waste time and soon Lucifer discovers that the Winchesters have lost Jack. Dean gets a call from the motel saying that their clerk went missing after a man matching Asmodeus’ description was asking questions. He then receives a call from Castiel trying to tell him about Lucifer, but Cas is interrupted by Lucifer before he can tell Dean anything useful. As they sit at the bar, Lucifer questions Castiel about his son. Asmodeus suddenly arrives, causing a look of worry on Lucifer's face. Walking through the bar, Asmodeus disintegrates the bartender, and confronts Lucifer. Lucifer attempts to bluff Asmodeus into leaving, which does not work, as Asmodeus knows that Lucifer is in a weakened state. With a simple hand gesture he sends both Lucifer and Castiel flying backwards into the bar. Tracking Castiel's cell phone, Sam and Dean arrive at the empty bar, only to be attacked by demons. The demons begin to get the upper hand, and as one is about to kill Sam, he is suddenly saved by Ketch. Despite this, Dean threatens him with a gun because he knows that he is Arthur, not Alexander. Ketch drops his facade, but says the story he gave was true, that he was in hiding from the British Men of Letters, and has been working as a mercenary under the alias "Alexander Ketch." Questioned as to how he is alive, Ketch reveals that some time ago, he captured Rowena, and discovered a powerful charm in her body that can resurrect her. In return for letting Rowena escape, she gave him the same spell that saved him from death, but it needs recharging after it is used, which is why he was hunting her down. He tries to argue that he is a good guy, but Dean doesn’t believe him. Dropping a flash bang, Ketch makes his escape, but is shot in the shoulder while fleeing the bar by Dean. With Ketch in the wind, Dean places a call to Castiel, asking what happened to him. Unbeknownst to Dean, he is speaking with Asmodeus, who is keeping Lucifer and Castiel prisoner as potential leverage over both Jack and the Winchesters. After hanging up with Dean, Asmodeus addresses Ketch, who has been hired to track down Jack. Lucifer: I got plenty of gripes with the old man. His self-righteous narcissism, His 'my way or the highway' quirk. I gotta hand it to Him. He had a couple of great seconds when He banged out the universe. Guy had creative chops. And optimism. I'll give Him that. And despite His pissiness and His massive lack of irony, He did give mankind a good turn at bat and a chance to live in paradise. He ruled. He smote. He parted waters. Worshipped by creatures who made God in man's image. And then, He got disappointed. Or worse, bored. Picked up all His toys and... left. What was that? Michael: Hitched a ride on your temporal lobe. Saw your world. That paradise you left behind? Believe I'll take up residence, lend my guiding hand. Lucifer: Hey, hey, hey. I got an idea. Why don't you whale on Mary Winchester for a while? I'll go get a latte, okay? Or not. Michael: Look at you. You claim to be a god in your world. Here, you're pathetic. Lucifer: Hey, you try interdimensional travel sometime, pal. Definitely no frills. And just to be clear, I never claimed to be God. Or a god, okay? Where I come from, God is a paradox. He's everywhere, in your mind. In reality, He's nowhere. He left. I, on the other hand, am the real deal. I am everything humanity thinks I am and worse. That's who you're dealing with, pal. But, hey, congratulations to you for being king of the hill of this dead rock. Lucifer: Kevin, what are you doing, getting mixed up with Michael? Kevin: I don't have a choice. I'm a prophet, so I serve God, but there's no God to serve, so I serve the ranking deity, which is Michael, because I don't have a choice because I'm a prophet. Lucifer: Idiot. Can't you see Michael is a monster? Pure evil? Kevin: Okay, I'm confused. Aren't you Satan? Which would make you the evil monster? And besides, Michael's taking me to paradise world so I can meet hot women. Dean: Don't mess with us, okay? You already killed Mick. You tried to kill us. You messed our mom right up. We're already pissed off. So I wouldn't do that. Dean: Do I look stupid to you? Ketch: Is that a trick question? Uhh! Oh! Sam: So, you're seriously gonna sit there with a straight face and tell us that you have an evil twin? Lucifer: Okay, I get it, I get it. Custody of my son is a non-starter. But if you can please just shelve the eternal enemies thing for a second, we have a situation. And by 'we,' I mean everything alive. We're sorta... all gonna die. Castiel: You'll forgive me if I'm a little on edge. The last time we were together, you killed me. Lucifer: Well, last time we were together, you stabbed me. Castiel: Work this out with me. Hypothetically, um, let's say you're lying, and I help you find your son, and then you kill me again. Lucifer: Cut me a little bit of slack. Please? That unhinged thing and that meth head Kevin Tran are about to bust through that door. God isn't here! It's just us. We're all we got, in case you hadn't noticed. Castiel: Well, I-I-I have to talk to Sam and Dean. Lucifer: Why, why, why, why, why, with all their second guessing and their whining? This is an emergency, Castiel, and all they're gonna wanna do is – is put me back in the Cage. Dean: You know, I gotta hand it to you. That paper trail you cooked up, pretty impressive. But my gut told me it was baloney. Looks like my gut was right. See, I've been in it with you, Arthur. I've seen your moves. We've gone toe-to-toe. And I saw that look in your eye when asked about our mom. So why don't you cut the crap? Ketch: Actually, everything I told you is true. Well, except for the, uh, twin brother thing. I am separated from the British Men of Letters, lying low because they will kill me for desertion. I make a rather good living as a sort of soldier of fortune, deep underground, for a certain sort of clientele who appreciate my skill set. And I do use the name 'Alexander'. Asmodeus: As I was sayin', I'm a collector. I like to be prepared. Lucifer could be useful. Castiel is a card to play if the Winchesters get out of line. And if there is any truth to the story that a new version of Michael is comin', I will definitely need that Nephilim. Ketch: You really needn't worry. "War of the Worlds" is a reference to the science fiction novel of the same name by H.G. Wells, about an alien invasion of Earth by Martians from Mars. Dean: Yeah, but isn't he too fast and furious for angels? The Fast and the Furious is an action film franchise based around street racing and heists. Kevin: I've assembled all the elements annotated in the angel tablets. Of course, I haven't done this before – no one here has – and any predictions are only predictive, not declarative probabilities being what they are or could be. Maybe. Or not. But a fly in the ointment exists. A "fly in the ointment" is a phrase denoting a minor flaw that can spoil something good. Michael: Don't screw with me, worm. Kevin: I'm a vertebrate, neither an annelid nor a nematode. Annelid is a scientific term for worm. A nematode is a species of roundworm. Asmodeus: Well, then how do you explain how Jack, the infamous Nephilim, along with the Brothers Winchester, all stayed in your No-Tell Motel? No-tell motel is slang for a motel used for the specific purpose of a sexual rendezvous. Ketch: Arthur was the family success story. The... headliner, our Donny Osmond. Dean: Mm. All right, Marie. What's your story? Donny Osmond, along with his sister Marie, are singers and actors best known for hosting the variety show Donny & Marie from January 1976 to January 1979. Sam: All right. For argument's sake, we know Mom shot Arthur, and we know we dumped his corpse into the waste canal. So even if this is weird, yes, it's weird, but we eat weird every day. Dean: Yeah, but there's 'Ripley's Believe It or Not!' weird, and then there's weird that's just straight up bull. Now I'm thinking that Ketch weird is door number two. Ripley's Believe It or Not! is a franchise known for the showcasing of strange feats and unusual claims. Lucifer: Drop the blade, Dumah. You hesitate? This isn't gonna be one of those 'make my day' moments, is it? Okay. Buh-bye. "Make my day" is a reference to the catchphrase made famous by the character "Dirty Harry" Callahan. Sam: You get a name? Dean: Nope. But... from his description? Evil Colonel Sanders. Asmodeus. Colonel Sanders was an Southern American business man, famous for creating Kentucky Fried Chicken. The name "Evil Colonel Sanders" was attributed to Asmodeus by the Supernatural fandom soon after his debut, due to his southern drawl and white suit. Farrah Aviva, who played Daniela, previously played Psycho Ghost in 7.19 Of Grave Importance. Erica Cerra, who played Dumah, previously played Robin in 6.22 The Man Who Knew Too Much. Caitlin Stryker, who played Lead Angel, previously played Stacey in 7.14 Plucky Pennywhistle's Magical Menagerie. Originally the dilapidated church that acts as Michael's fortress was scripted as a concrete bunker in the desert. However, set designer Jerry Wanek was given free rein and built a church set instead. As revealed by Castiel in 8.07 A Little Slice of Kevin, angels instinctively know the names of every prophet – past, present, and future – explaining how Lucifer is able to recognize the Apocalypse World version of Kevin Tran. Lucifer begins wearing a beige-colored jacket this episode. He previously wore a beige coat while using Casitel's vessel in season 11. Furthermore, Jack was shown wearing a beige suit in 13.06 Tombstone. The bar Castiel and Lucifer go to discuss recent developments is called "Nick's Bar." Nick is the name of Lucifer's vessel, and "Old Nick" is a colloquialism for the Devil. Due to the episode airing on Thanksgiving in the United States, the rating was below the season's average at 1.24, making it the lowest rated episode of the series. Coincidentally, writers Brad Buckner and Eugenie Ross-Leming now hold the distinction of writing both the highest rated episode, 1.13 Route 666, and the lowest rated in the series' history. This page was last edited on 9 November 2018, at 02:12.